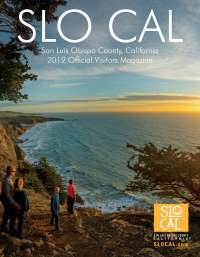 San Luis Obispo (SLO) County boasts nearly 315 days of sunshine, 80 miles of accessible coastline, seemingly endless hiking trails and enough roadway to keep you cycling from sunup to sundown. Live like a local for a day and experience everything from yoga on a paddleboard to hiking three of the seven (hikeable) sisters. When you&apos;re in SLO County the experiences are endless but we&apos;ve curated 10 ways you can get out and get active when you visit. Rent a kayak in Avila Beach then traverse the blue waters over to the Port San Luis Lighthouse. Park your kayak at the bottom and explore the beautiful grounds of this lighthouse, which is still in operation. Cross two things off the list at once with a quick paddleboard trip into the bay. Find your balance and practice your tree pose, downward dog, and warrior pose while enjoying the serenity of Morro Bay. This local favorite rewards your tired and weary body with a SLO County delicacy. Lace up your best hiking shoes because we&apos;re sending you out to hike The Cal Poly P, Cerro San Luis and Bishop Peak all in one day. Wondering why they call it the Tri-tip Challenge? After completing the tri-peaks, reward yourself with a Tri-tip Sandwich! If you&apos;re an avid or budding cyclist, hop on your bike and complete a ride that traverses you through the Adelaida wine country area of Paso Robles, out to Cambria and back. For those of you looking for a leisurely ride look no further than the scenic Bob Jones Trail in San Luis Obispo. Enjoy a roughly 2 mile path that takes you from San Luis Obispo out to the heart of Avila Beach. Let the sand squish between your toes and Fido&apos;s paws. Park just off Highway 1 in the city of Cayucos at the south end of 24th Street or the northernmost entrance to Studio Drive. Whether you sit and relax while watching surfers and passing dolphins or walk until you reach Morro Bay, you and your furry friend will surely enjoy a blissful day at the beach. Get a little mud on your tires along the Hazard Peak Trail in Montana de Oro near Los Osos. You don&apos;t have to be an expert to traverse this trail. This 4.1 mile ride meanders through a Eucalyptus Grove and offers spectacular views of the surrounding area, especially once to the top of Hazard Peak. Go during the spring and you&apos;ll be greeted by a beautiful wildflower display! Fore! Tee up and get ready for a fun time on one of our many golf courses in SLO County. From golfing amongst the oaks in Paso Robles at Hunter Ranch Golf Course and Chalk Mountain Golf Course in Atascadero, feeling the cool sea breeze at Avila Beach Golf Resort and Morro Bay Golf Course to being surrounded by an Audubon Sanctuary at Dairy Creek in San Luis Obispo, the courses of SLO County are definitely a hole in one on our scorecard. Zip up that wetsuit and paddle through the waves for a classic California experience in Pismo Beach. Book a lesson on your next trip and become one with the surf and gain bragging rights you&apos;re friends and family will surely be jealous of. Take a timeout from your vacation to enjoy the crashing of waves, beautiful Monterey pines and a stroll in Cambria. The Moonstone Beach Boardwalk is a 1.4 mile (or 2.85 miles round trip) stretch that hugs the coastline and even allows you to hunt - for moonstones that is.